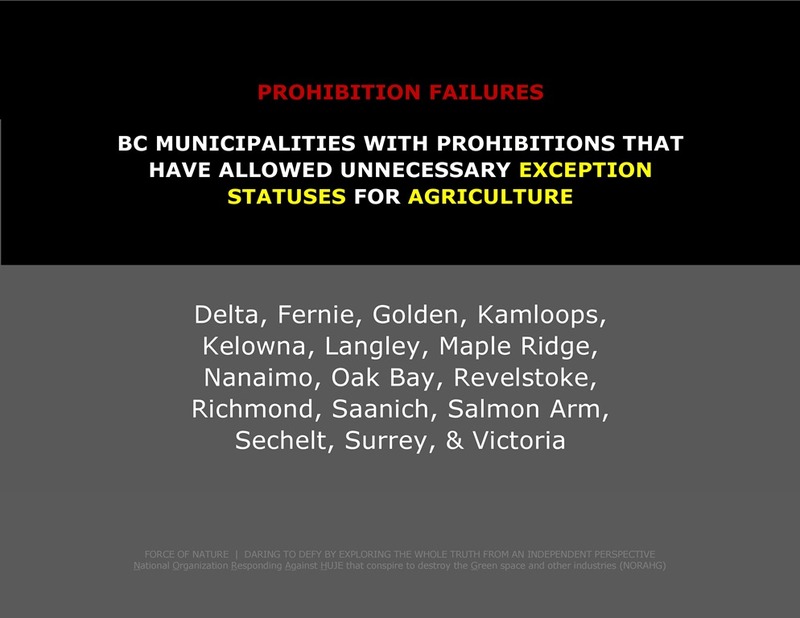 Why Are Municipal Prohibitions Failing In British Columbia ?!?! The imposition of prohibition against conventional pest control products used in the urban landscape is a DISMAL FAILURE ! 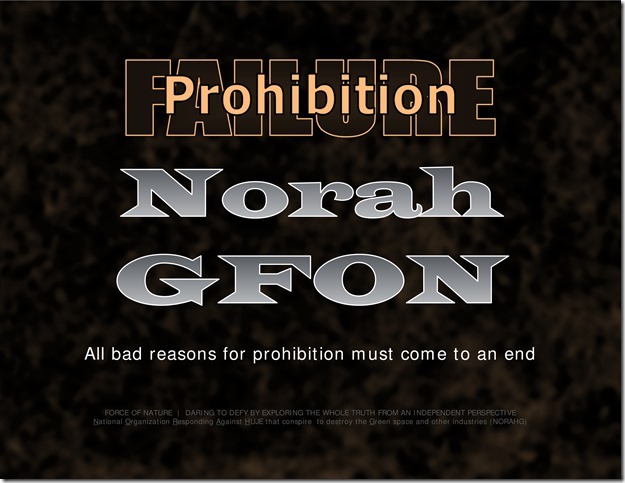 These prohibitions have been extremely biased, highly prejudicial, inconsistent, unfair, subversive, & destructive ! These arbitrary by-laws — prohibiting some products but NOT others, and to some uses but NOT others — will NOT stop the public from realizing that false-facts are being spread by municipal officials. It is a fact that municipalities have empowered themselves to arbitrarily prohibit safe & effective conventional pest control products, and, with extreme bias & total prejudice, allow higher-risk, ineffective, & inferior green alternatives because it aligns with their political precepts & doctrines ! It is a fact that municipal prohibitions are NOT based on scientific evidence, but rather, they are driven by agenda, ideology, propaganda, & fake-news. In all cases, municipal prohibitions against conventional pest control products have become dismal failures that have led to catastrophic business, ecological, & financial carnage ! It is also a fact that municipal officials are now circumventing their own prohibitions by taking advantage of exception statuses that they have conveniently inserted in their by-laws ! 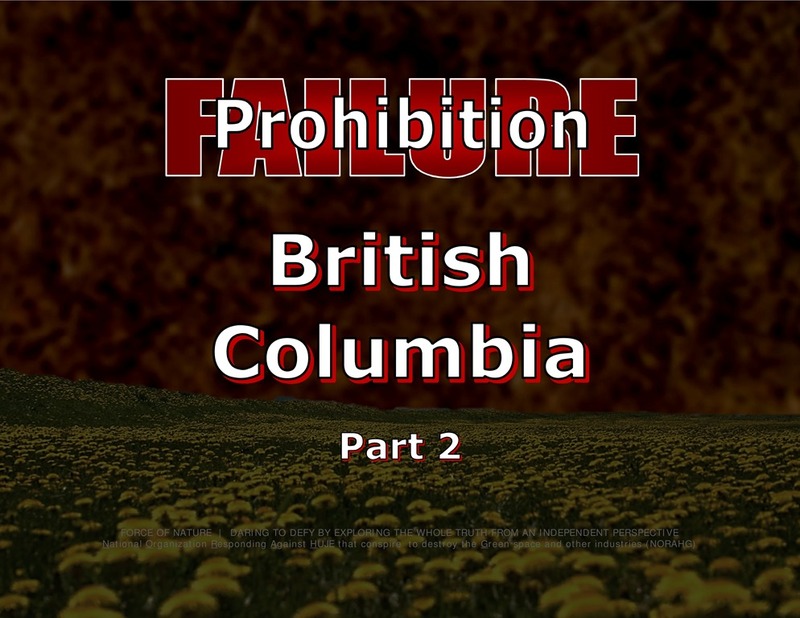 Or, in many cases, these officials seek to rescind or avoid prohibition altogether. Prohibitions Rely On False-Facts Regarding The Imaginary Danger Of Conventional Pest Control Products ! Municipal prohibitions have been imposed by adopting the false-pretext that residents & the environment are somehow being protected. 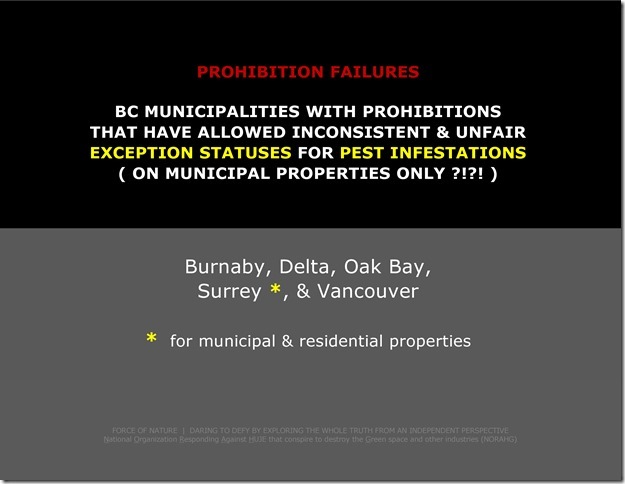 The false-facts used by municipalities to validate these prohibitions has been confusing & inconsistent, and conflicts with national regulatory agencies around the world, that are relied upon for health and safety assessments. Overall, the risk assessment of conventional pest control products indicates that they are scientifically-safe, and, when used properly, will NOT cause harm to children, people, animals, or the environment. 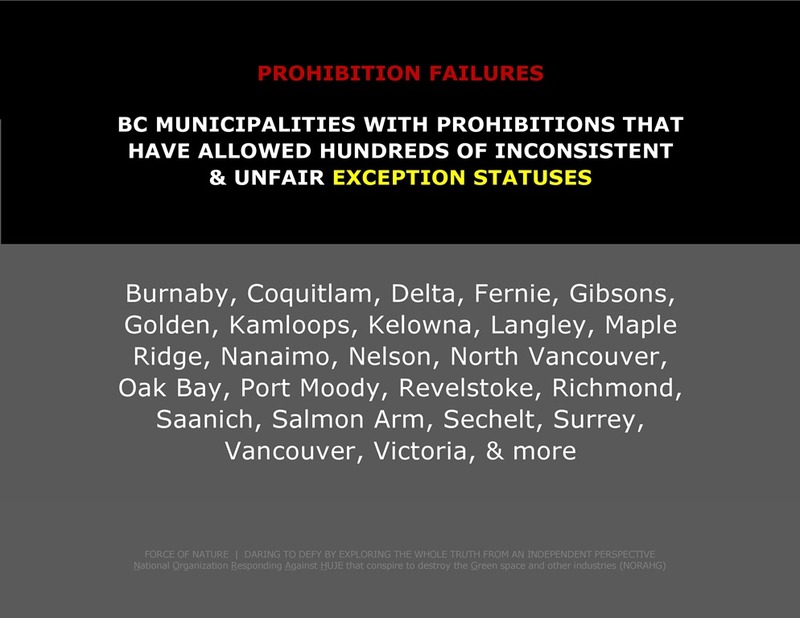 Because of their adoption of false-facts, prohibitions have been dismal failures for municipalities in British Columbia ! Prohibitions Allow Thousands & Thousands Of Exception Statuses ! 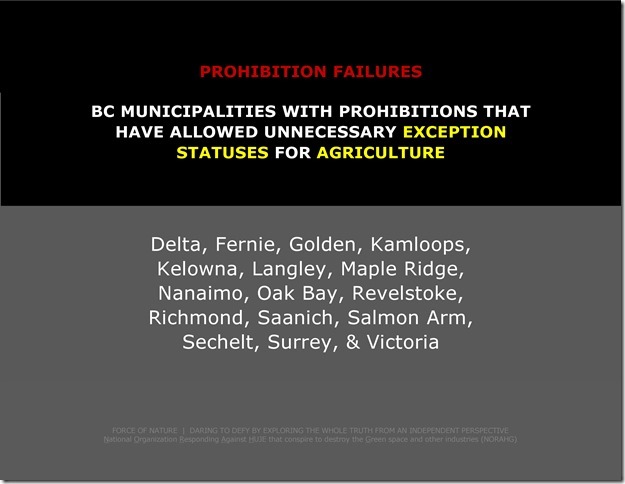 Exception statuses have represented the best examples of the failures & the ridiculousness of anti-pesticide prohibition ! While imposing their arbitrary by-laws — prohibiting some uses but NOT others through exception statuses — municipalities CANNOT stop the public from realizing that a large quantity of deliberate mis-information & propaganda has been spread about the imaginary danger of conventional pest control products. 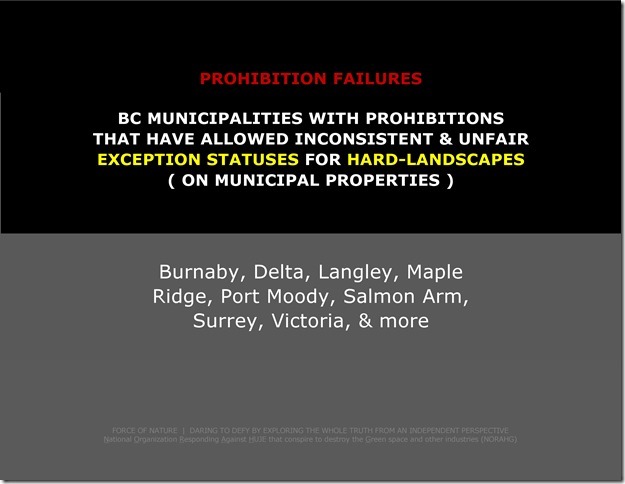 Despite imposing prohibition, municipalities have allowed thousands & thousands of inconsistent & unfair exception statuses, including agriculture, forestry, fruit gardens, fruit trees, golf facilities, greenhouses, hard-landscapes, industrial properties, institutional properties, lawn care businesses, lawns that need to be safe for use, new lawns ( seeded ), municipal infra-structures, municipal green spaces, commercial properties, new parks, pest infestations, public infra-structures, rose gardens, sports fields, urban forests, vegetable gardens, and more. 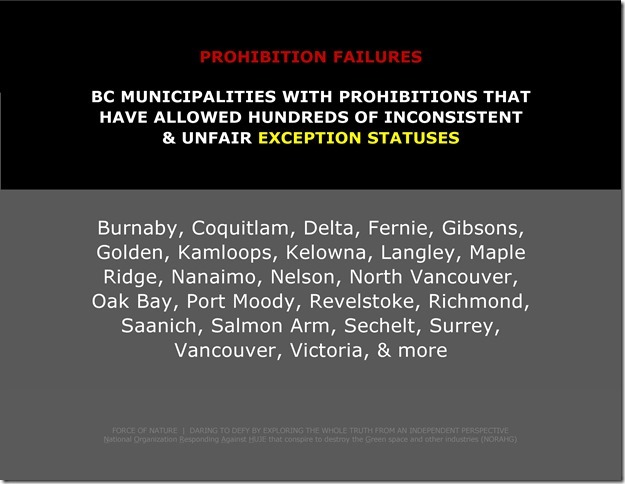 These exception statuses have been conveniently incorporated into by-laws in order to allow municipal staff to circumvent prohibition, to arbitrarily suit the needs of elected officials, and to falsely maintain alignment of these officials with their political precepts & doctrines ! Exception statuses have inconsistently & unfairly allowed the use of conventional pest control products on municipal green spaces, like sports fields, that are infested with invasive weeds & destructive insects, which must be controlled annually in order for playing surfaces to remain safe & attractive. Some by-laws have even allowed the selling of exception status permits, hence becoming a profit center for the municipality. In fact, there should be NO #@! !% exception statuses whatsoever ! 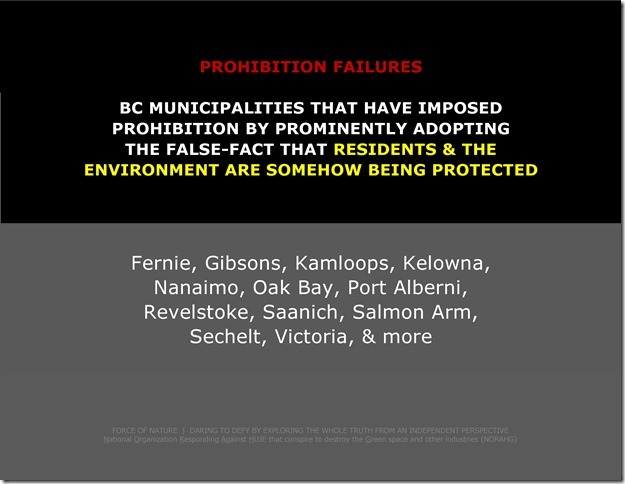 Otherwise, prohibitions will continue to be dismal failures for municipalities in British Columbia ! 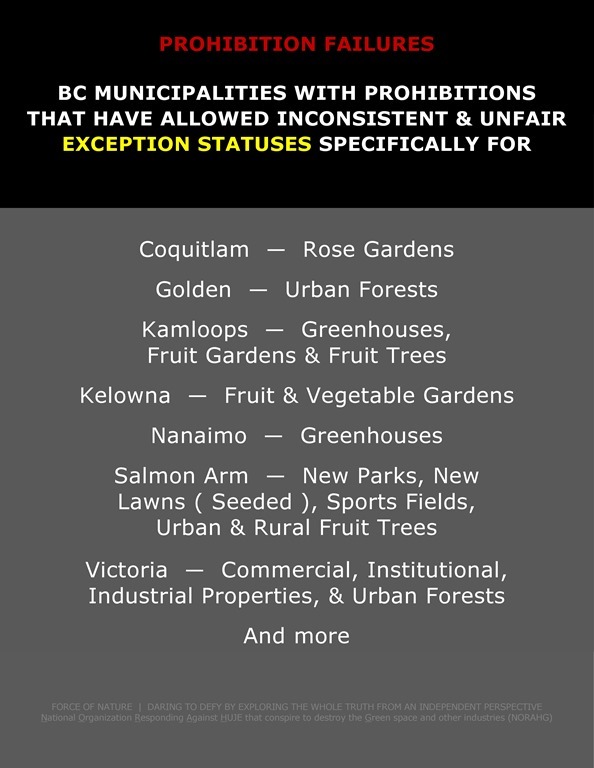 Prohibitions Allow Thousands Of Exceptions For Municipal Green Spaces ! 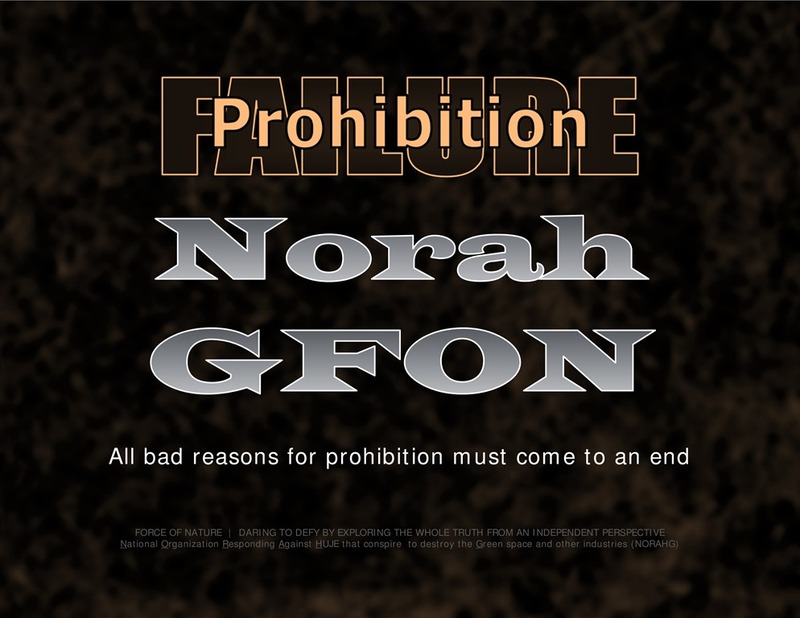 Prohibition by-laws contain VAGUELY-DEFINED or UNDEFINED terms like ” infestations ” or ” invasion “ ― these have been inserted by elected officials as another convenient escape from their own restrictions ! 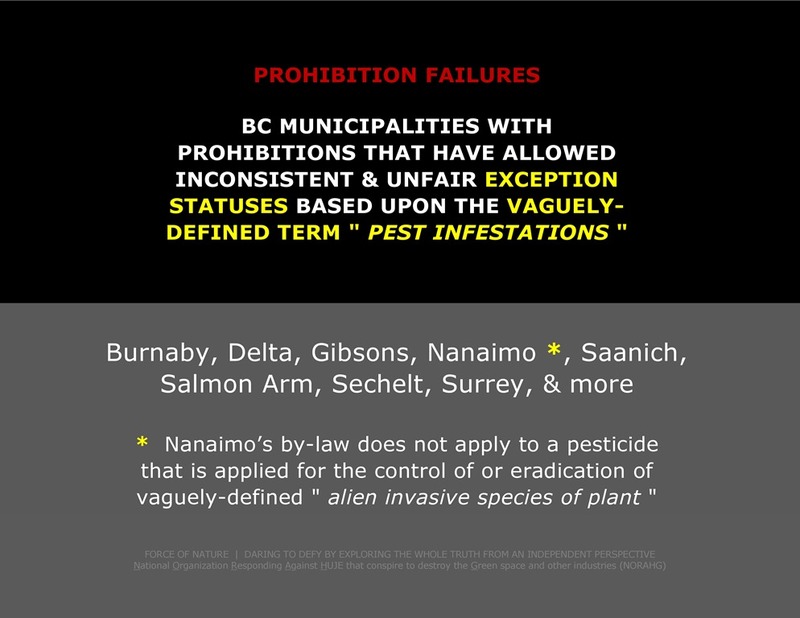 These terms have been incorporated into by-laws in order to allow municipal staff to circumvent prohibition to control pests with the use of otherwise prohibited conventional pest control products ! In order to be consistent & fair, there should be NO #@! !% exception statuses whatsoever ! With Prohibitions, Residents Are Always Shжt-Outta-Luck ! 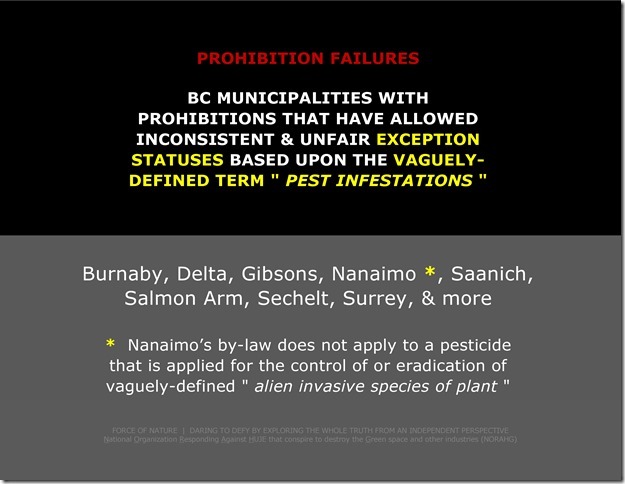 Municipal prohibitions have provided inconsistent & unfair exception statuses for invasive weeds & destructive insects ― for municipal properties ― but NOT for residential properties ! While imposing their arbitrary by-laws — prohibiting products from being used on residential properties, but NOT municipal properties — elected officials have been telling residents that they are shжt-outta-luck with protecting their private property from invasive & damaging pests. Overall, these pesticide-hating elected officials will NEVER agree to allow the required annual application of conventional pest control products for the control damaging ” pest infestations ” on residential properties ! But, sadly, they have been inclined to do so on their own municipal properties. Furthermore, any pest INFESTATION on residential property would be arbitrarily & politically defined in the harshest manner possible by municipal officials. NO resident wants to be shжt-outta-luck with protecting their private property ! NO resident wants to live in #@! !% pest-infested garbage dumps ! In order to be consistent & fair, residents should not be treated in this manner ! 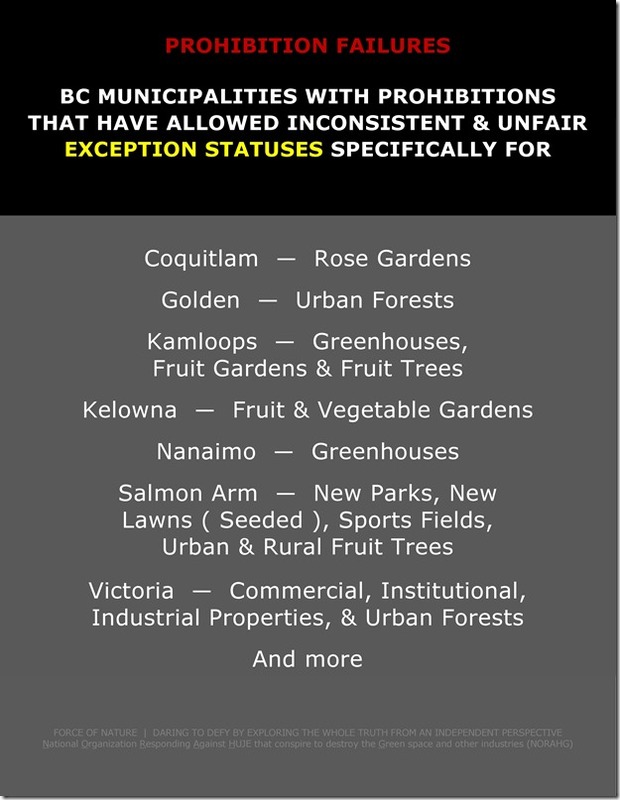 Prohibitions Allow Exceptions For Pesticide-Free Green Spaces That Would Otherwise Be Unsafe Or Dangerous For Residents ! 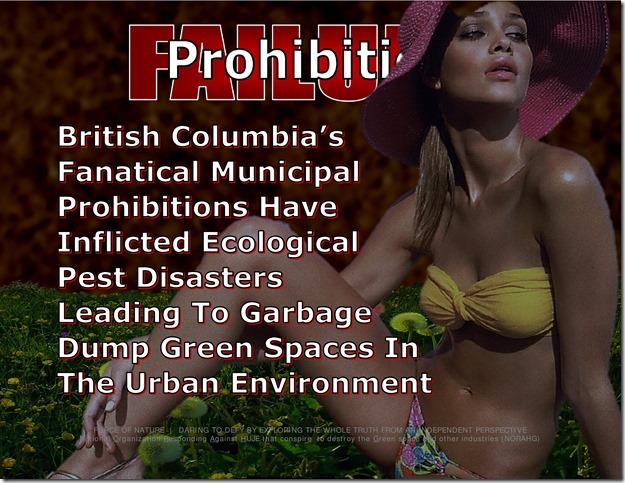 British Columbia’s municipal prohibitions have inflicted ecological pest disasters leading to dangerous & unattractive garbage dump green spaces in the urban environment. These prohibitions have created conditions where … • municipal & residential properties have been ruined by uncontrolled weed invasion & insect destruction • weeds have invaded lawns, and dandelions have become the dominant ground cover • lawns have been decimated by destructive insects like European Chafers • playing surfaces have become hazardous to children who are at high risk of tripping and becoming seriously hurt • infra-structures have been damaged by invasive noxious plants like Japanese Knotweed & Giant Hogweed. This is the catastrophic carnage that can be expected by any community that considers the imposition of prohibition against conventional pest control products used in the urban landscape. 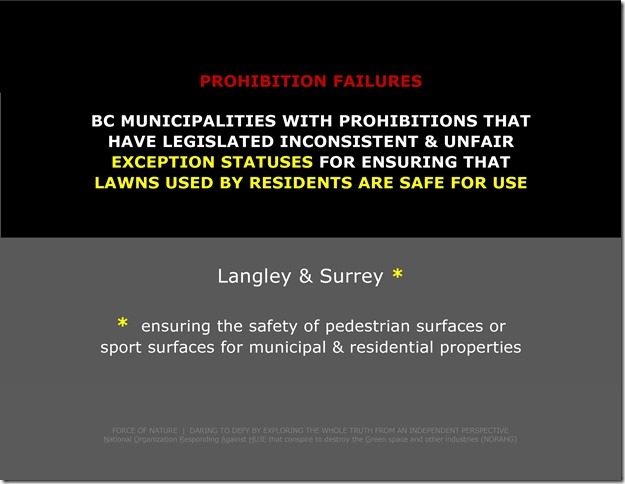 Fortunately, SOME prohibition by-laws have allowed exception statuses for ENSURING THAT LAWNS USED BY RESIDENTS ARE SAFE. 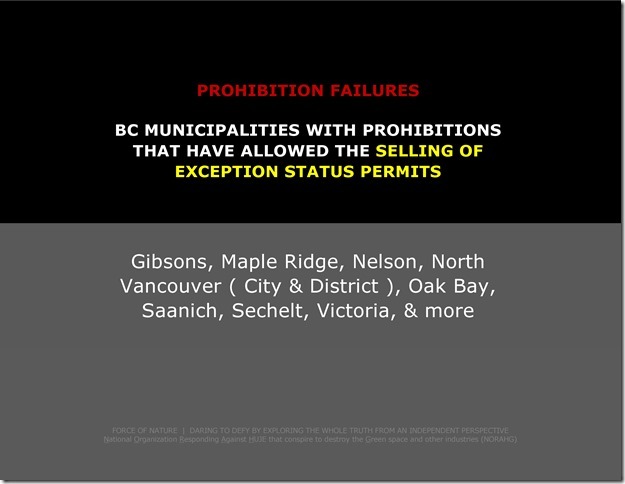 However, this exception is a clear admission that prohibitions will continue to be dismal failures for municipalities in British Columbia. And, in order to be consistent & fair, there should be NO #@! !% exception statuses whatsoever ! 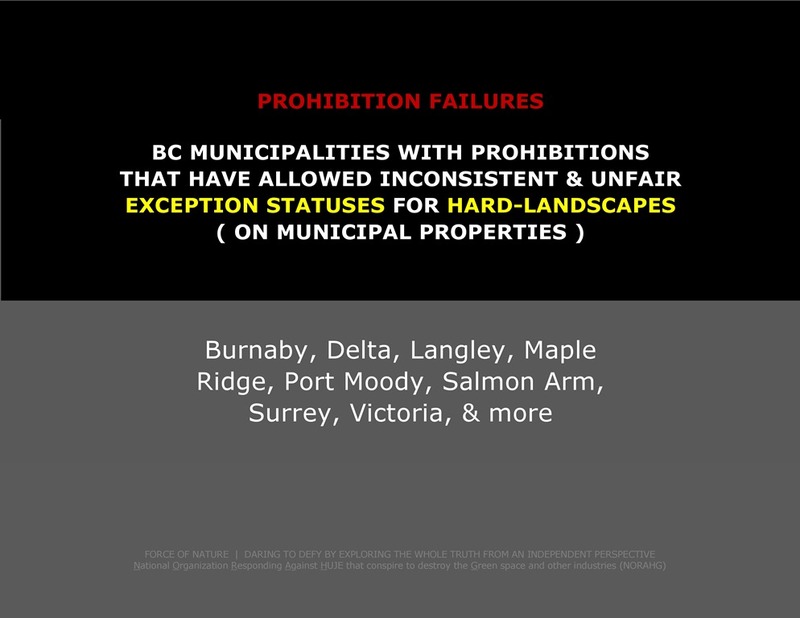 Prohibitions Allow Exceptions For Municipal Hard-Landscapes & Infra-Structures ! 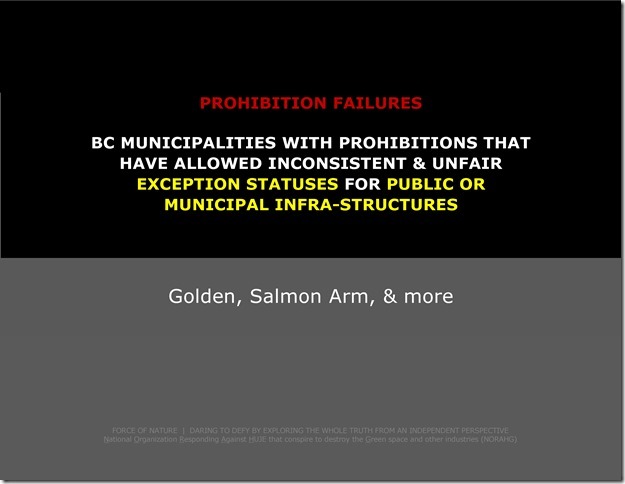 Municipal prohibitions have allowed thousands of inconsistent & unfair exception statuses for hard-landscapes & infra-structures ! Examples of hard-landscapes & infra-structures include ― asphalt, brick pavers, buildings, concrete, gravel, pipelines, public utility corridors, rocks, transportation corridors, treated wood, wood preservatives. 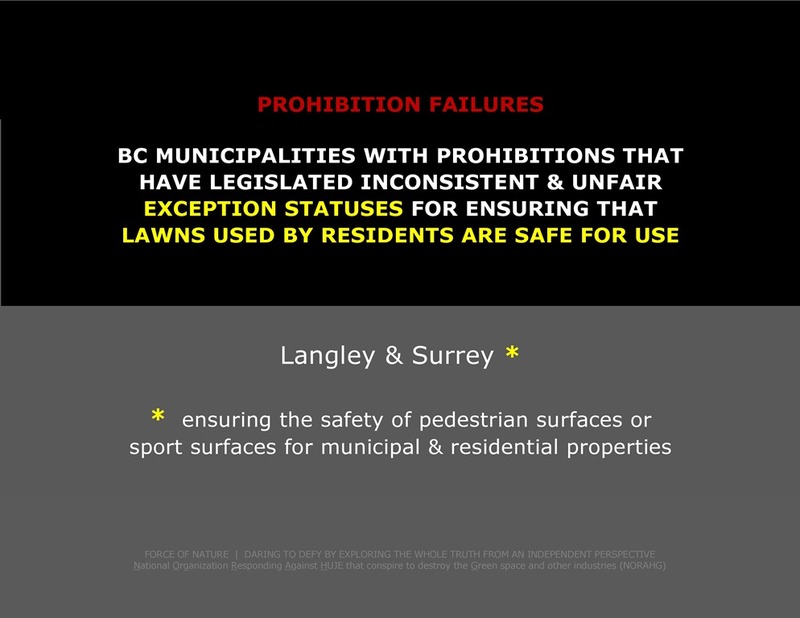 If it is safe for children and adults to walk and play on or near herbicide-treated hard-landscapes & infra-structures, then why is it not safe for them to walk and play on herbicide-treated lawns ?!?! 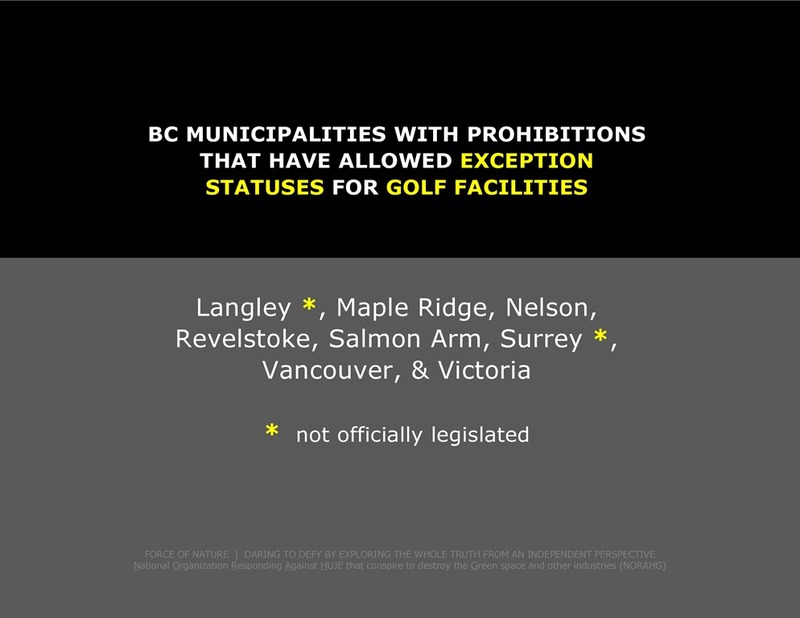 Prohibitions Allow Exceptions For Golf Facilities ! Although not always specifically legislated in their prohibition by-laws, municipalities have always provided an exception status for golf facilities. 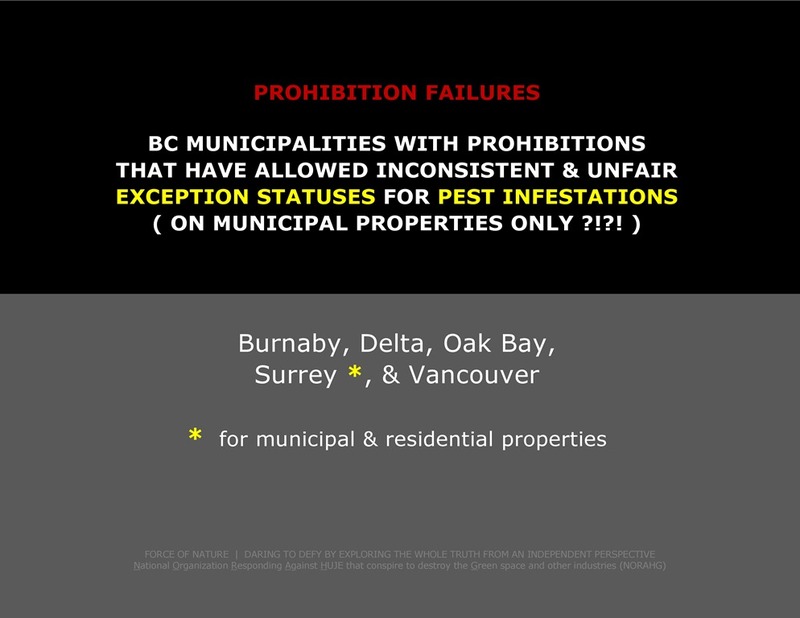 While imposing their arbitrary by-laws — prohibiting uses on residential properties but NOT on golf facilities — municipalities CANNOT stop the public from realizing that hundreds of exception statuses have been provided despite the fact that up to 15 per cent of ALL conventional pest control products are used by the golf industry. Interestingly, golf facilities often employ the very same conventional pest control products that are used to control pests that damage municipal & residential properties. If it is safe for children and adults to walk and play on pesticide-treated golf facilities, then why is it not safe for them to walk and play on pesticide-treated lawns ?!?! 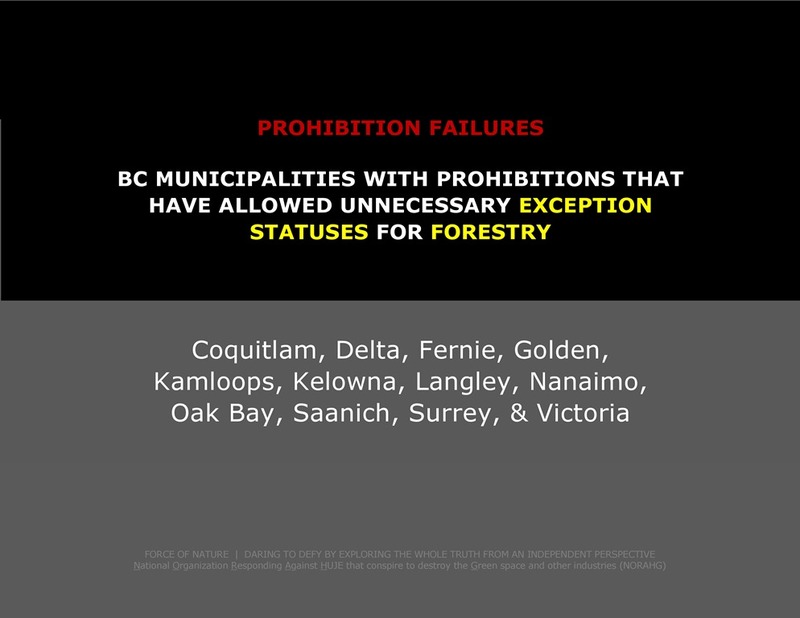 Prohibitions Allow Exceptions For Agriculture & Forestry ! 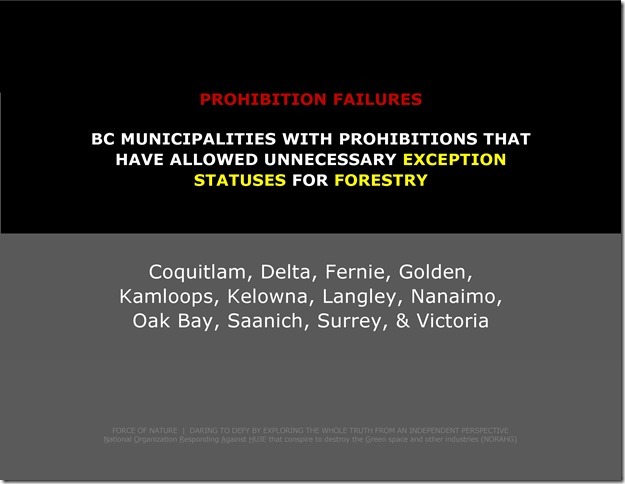 Although not always specifically legislated in their prohibition by-laws, municipalities have always provided exception statuses for agricultural crops & forest trees. Nonetheless, both the agriculture & forestry industries employ ingredients that are similar to those used to control pests that damage municipal & residential properties. Over 70 per cent of all conventional pest control products are used by the agriculture & forestry industries. If it is safe for children and adults to eat on pesticide-treated food crops, then why is it not safe for them to walk and play on pesticide-treated lawns ?!?! 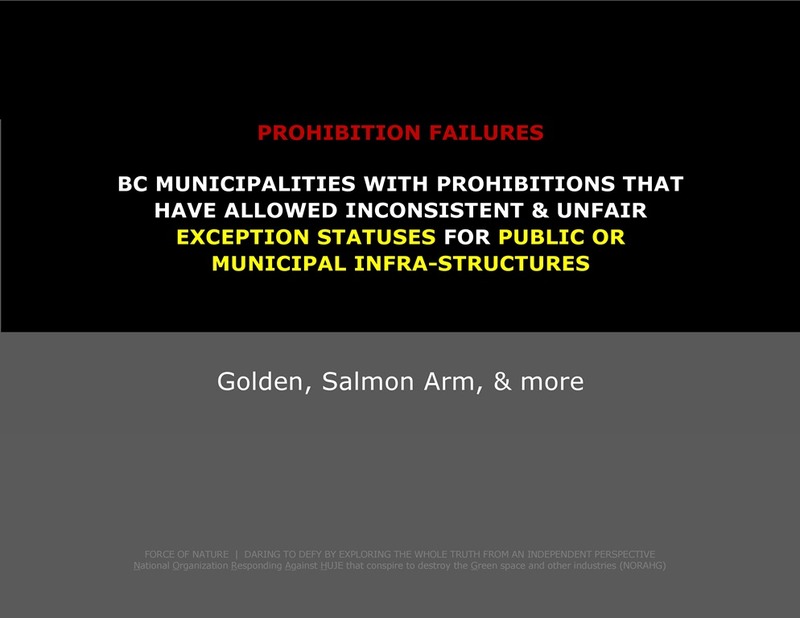 The Community Charter is comprehensive, flexible legislation which provides all municipalities in British Columbia, except the city of Vancouver ( which operates under the Vancouver Charter ). What is the purpose of the Community Charter ?!?! The Community Charter replaces the tradition of prescriptive legislation that tells municipalities what they can or cannot do, with enabling legislation that allows municipalities to be innovative in meeting the needs of their communities. ( iv ) under section 8 ( 3 ) ( k ) of the Act, the control of wildlife species listed in Schedule B or C to the Designation and Exemption Regulation, B.C. Reg. 168/90. ( d ) on land used for AGRICULTURE, FORESTRY, transportation, public utilities or pipelines unless the public utility or pipeline is vested in the municipality. 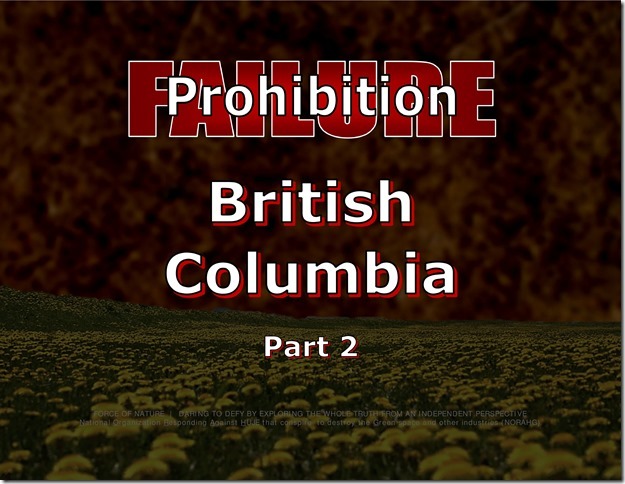 WE SPEAK THE WHOLE TRUTH ABOUT PROHIBITION FAILURES IN BRITISH COLUMBIA, FROM AN INDEPENDENT PERSPECTIVE ! 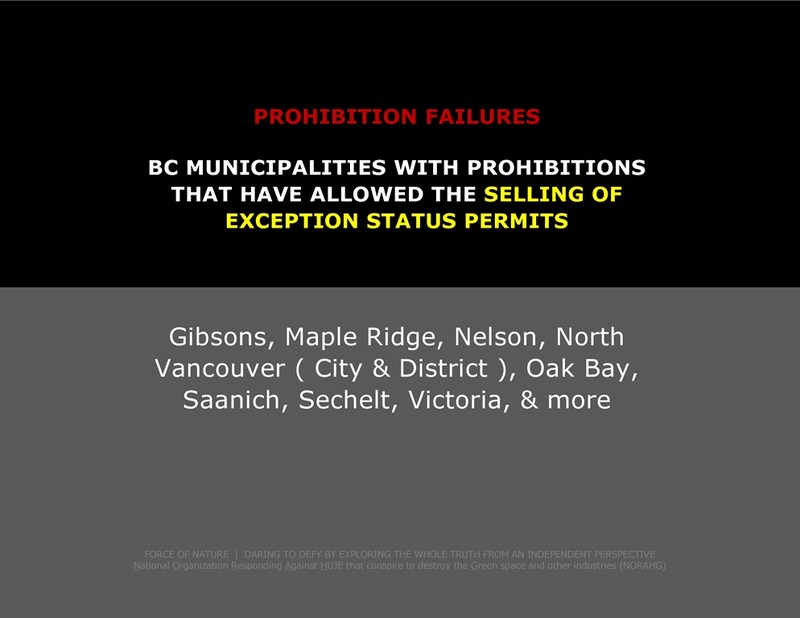 Read about the PROHIBITION FAILURES concerning the following municipalities – Burnaby, Campbell River, Coldstream, Coquitlam, Delta, Fernie, Gibsons, Golden, Kamloops, Kelowna, Langley, Maple Ridge, Nanaimo, Nelson, North Vancouver, Oak Bay, Parksville, Port Alberni, Port Moody, Revelstoke, Richmond, Saanich, Salmon Arm, Sechelt, Surrey, Vancouver, and Victoria.